Learn how to make barbecue chicken indoors with these Easy Honey BBQ Oven Baked Chicken Drumsticks. Smothered with a sweet and smoky thick barbecue sauce. Tender and moist oven baked BBQ chicken legs that everyone will love. 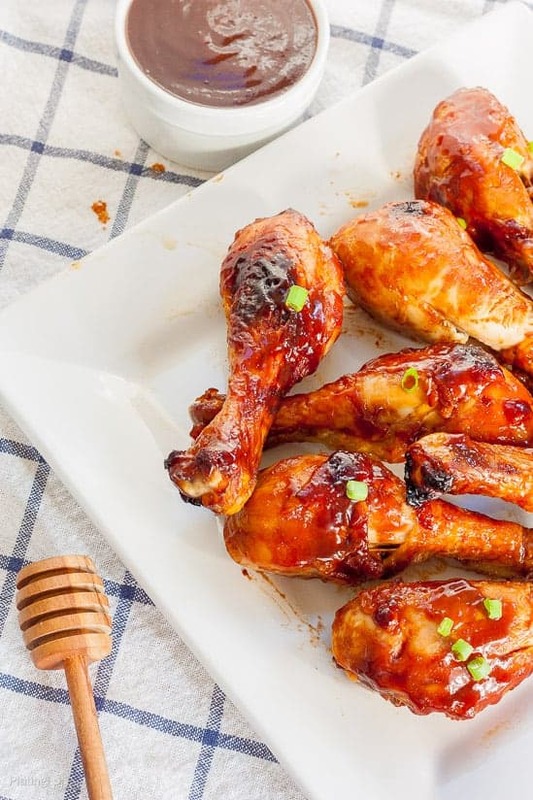 Within this post, you’ll learn how to make an easy Oven Baked Honey BBQ Chicken Drumsticks. It tastes like grilled chicken but made indoors. Plus you’ll learn why it’s better (and safer) not to rinse your chicken before cooking. 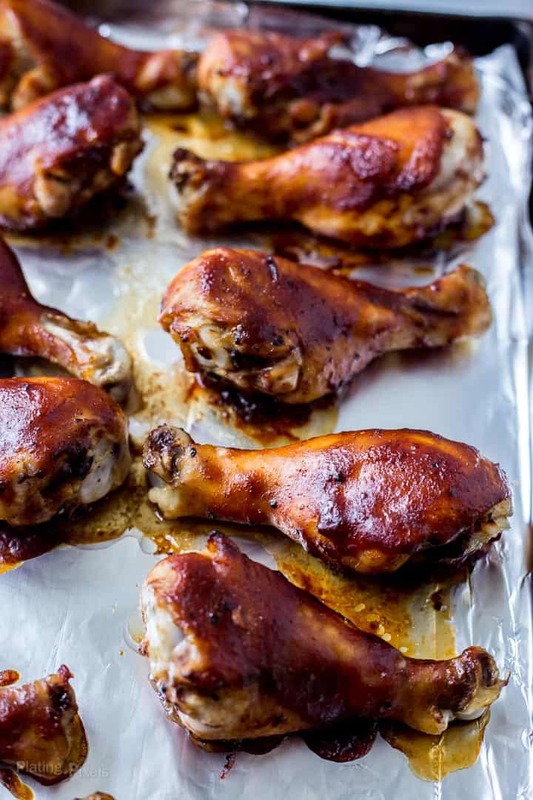 These may be the easiest oven baked BBQ drumsticks you’ve ever had. Only a few ingredients and short prep time are needed. Salt and pepper to the chicken legs bring out more flavor, and that’s it; easy oven baked BBQ chicken drumsticks. These drumsticks are so moist and juicy, you’ll be licking your fingers until the last bite. BBQ sauce: Adds loads of flavor and a thick, saucy coating. Choose a good quality one with lots of flavor. Honey: Adds a delicious sweetness to the sauce. Salt and pepper: Enhances the flavor of meats. If chicken drumsticks are frozen, defrost in the fridge 1-3 days before. Pat chicken drumsticks dry with paper towels to remove excess moisture. Place chicken drumsticks on a large foil or parchment lined baking pan. Lightly sprinkle both sides with salt and pepper. Mix together barbecue sauce and honey in a small bowl. Brush both sides of drumsticks with sauce. 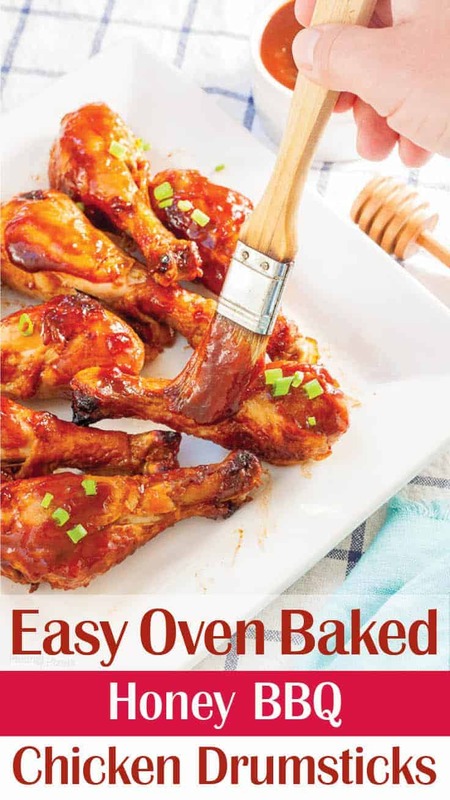 Bake for 25 minutes at 375º F. Rotate drumsticks and generously coat tops with rest of sauce. Bake 20–25 minutes more, or until chicken reaches a safe internal temp of 165º F.
To help make baked chicken drumsticks moist buy chicken with the skin on. The skin adds a lot of flavor to the meat and it also helps seal in the moisture keeping the chicken juicy while cooking. Chicken drumsticks without the skin can easily dry out. Coating in barbecue sauce keeps chicken legs moist as well. When it comes to the BBQ sauce choose a good quality one and mix it with honey. The honey adds extra sweetness and sticky texture to the sauce which I love, it also helps the sauce stick to the chicken. Keep an eye on the internal temp and don’t overbake. Remove from oven once chicken drumsticks reach 165º F.
Don’t cover chicken drumsticks when baking. This will create a soggy skin. 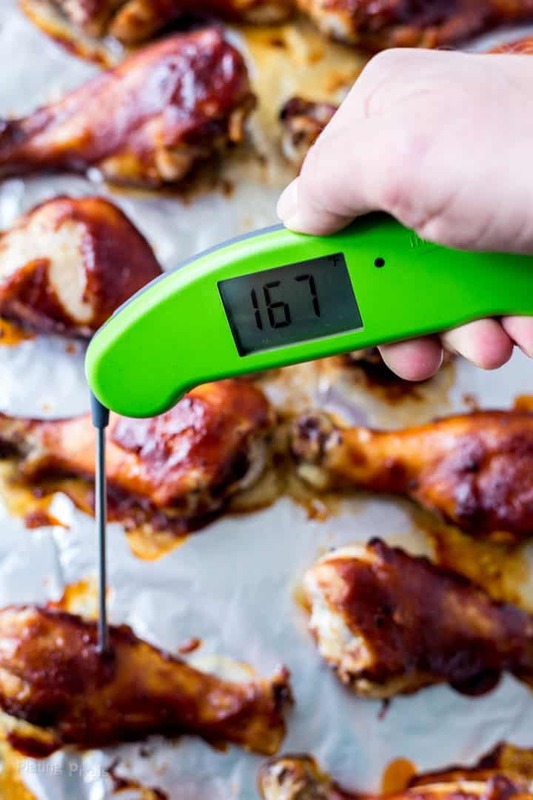 Use a thermometer to check that internal temperature has reached 165º F. This is the safe temp for chicken and it will be cooked all the way through. If you don’t have a thermometer be sure the inside of the meat is no longer pink before serving. Should you rinse chicken before cooking? You should not wash chicken before cooking. It’s unnecessary and spreads bacteria. Chicken has already been cleaned and washed before packing. Rinsing spreads germs and bacteria in your kitchen sink. You may have been told to rinse your chicken before cooking, or that’s what your family always did growing up. To be honest, I even used to do that. The safe temp for chicken is 165º F. As soon as it reaches that, your chicken is safe of any bacteria and is perfectly cooked. No washing needed. 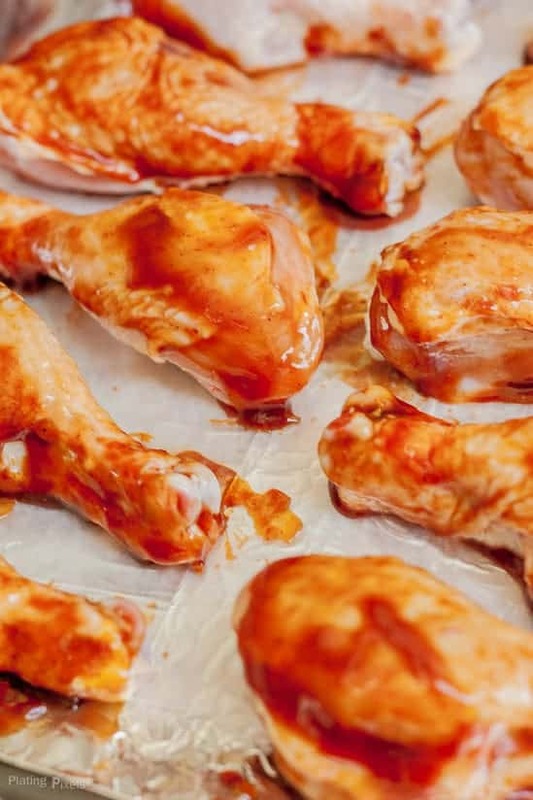 Can you bake chicken drumsticks frozen? You can by adding extra baking time but it’s not recommended. The skin my dry or brown too quickly, plus the BBQ sauce will not soak in as well. The flavor and texture will not be as good. If chicken legs are frozen, plan ahead and defrost in fridge 1-3 days before baking. Are baked chicken drumsticks healthy? Since these chicken drumsticks aren’t fried these can be a healthy addition to your dinner or appetizer menu. Each drumstick with skin on has roughly 180 calories and 13 grams of protein. Not bad for so much flavor. The BBQ sauce adds sugar so look for a lower sugar variety if desired. Honey adds sweetness and unique flavor but can be omitted to reduce sugar content. Are baked chicken drumsticks keto? BBQ baked chicken legs can be a great addition to your keto diet. If following a high-fat diet, the skin will add plenty of fats paired with lean protein, plus chicken has no carbs or sugar. Substitute a keto-approved barbecue sauce with no added sugars. Also, omit the honey. Flavor profiles: Meaty, roasted, and slightly sweet. Umami from tomato-based barbecue sauce. Texture: Tender, moist and a thick, finger-licking sauce coating. Dietary Options/Substitutions: Look for gluten-free or paleo barbecue sauce if needed. 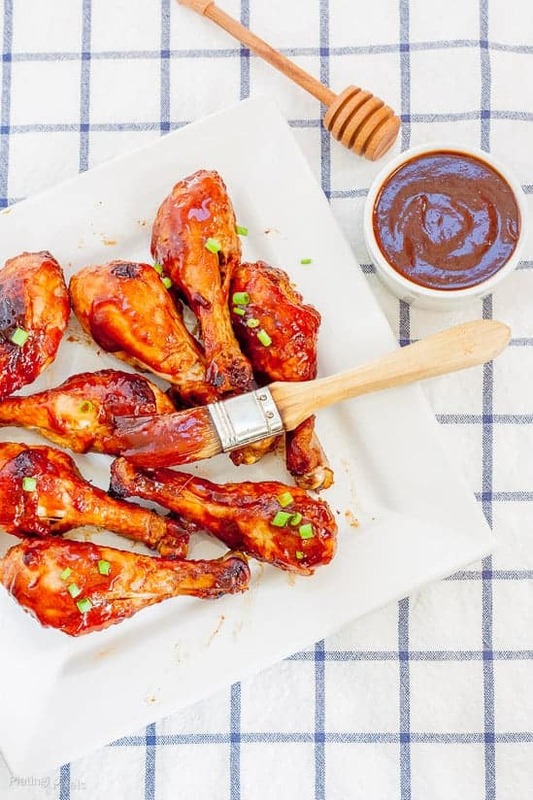 For keto chicken drumsticks use a keto-approved BBQ sauce and omit the honey. Easy Oven Baked Chicken Drumsticks smothered with sweet and smoky thick barbecue sauce. If chicken drumsticks are frozen, place in the fridge to defrost 2-3 days before baking. Preheat oven to 375º F. Let chicken sit at room temp 20-30 minutes. Pat chicken dry with paper towels to remove excess moisture. Do not rinse before; see cooking tips section above for details. Mix together barbecue sauce and honey in a small bowl. 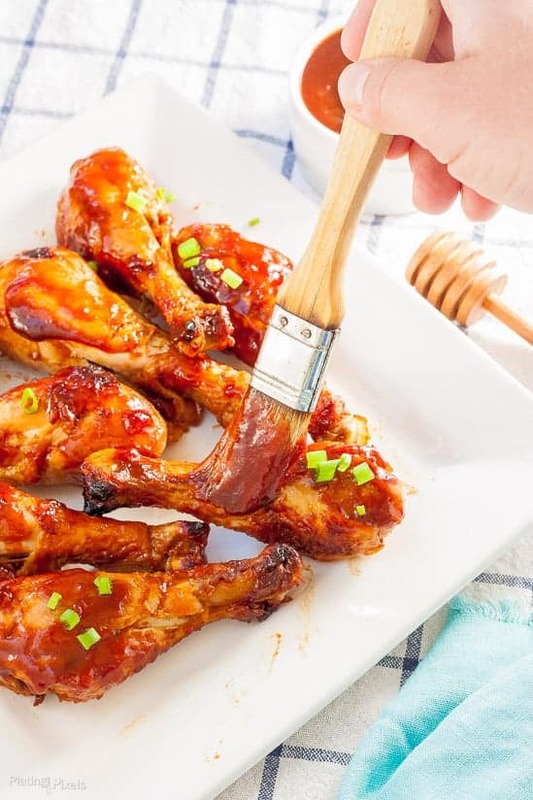 Use a brush to generously coat both sides of chicken drumsticks with barbecue sauce. Note: use about ⅔ of the sauce. Bake for 25 minutes. Rotate drumsticks and generously coat tops with rest of barbecue sauce. Note: If sauce spilled onto foil and is browned, transfer drumsticks to a clean baking sheet with foil to prevent burning of sauce. Bake 20 minutes more, or until chicken reaches a safe internal temp of at least 165º F. Remove from oven and let cool slightly. Optional: Brush tops with additional barbecue sauce (that hasn't touched raw chicken) using a clean brush before serving. Don't rinse the chicken beforehand, rinsing spreads germs and bacteria in your kitchen sink. Don't cover chicken drumsticks when baking. This will create a soggy skin. My favorite part of a chicken. Every time I go to restaurants and order a chicken dish, I always tell them that I want the thigh part where the drumsticks are. lol Thank you for sharing! Definitely going to make this! Thanks so much for the feedback and I hope you do Raiko! These oven-baked BBQ chicken legs will be a hit in my family! We have been opting for oven-baked options and love bbq so this is going to be great! Perfect! Now I can have tasty wings without freezing outside over the grill! Just in time for Game Day! You had me at wings…these will be perfect for game day. Baking chicken drumsticks are definitely so much easier, love how easy these are but with plenty of flavor. Love how easy and flavorful these are! These are mouth-watering delicious!! Chicken is supposed to cooked to an internal temperature of 180°F, not 165°F. 165°F is the temperature which chicken can be held at after it has been cooked thoroughly (180°F) before entering what’s referred to in food safety as “the danger zone” where any and all bacteria on or in the food starts to rapidly multiply and causes food poisoning. Thanks for sharing this recipe. I made it, and it was delicious. And so easy! My children and grandchildren loved these drumsticks! So glad to hear that and thanks for the feedback Clara! Do you trim the skin off the drumsticks? Hi Abby. It’s optional, if you leave skin on you get a nice crisp texture when baked. If you want healthier then I’d remove. Thanks! What a super easy recipe! Just what a mom needs on a busy weekday. I have a similar sweet and spicy chicken. Thanks Valerie! Yours looks great too! I like the addition of soy sauce and Dijon. I can’t beieve how simple this recipe and how droolworthy all the photos are! We currently don’t have a grill/bbq so this recipe is perfect for a sunday dinner! Love it! It’s about as easy as you can get. I’m in the same boat so oven baked BBQ is perfect. Thanks Selena! I would love to get some sticky fingers right now! These BBQ chicken drumsticks look amazing. So delicious! These are definitely sticky, and yummy! Thanks Oana! These look oh so delicious and easy to make, I’ll have to give them a go! Thanks Swah! Hope you like it! These look perfect! 🙂 I need to grill more than I have this summer! Thanks Alice! I do too! Luckily a lot of my friends like to cook so hope to be doing more. Hi Matthew and Olia, I was surprised to read about washing chicken, makes sense though! I love everything about this recipe and look forward to making it, we love drunnies in our house! Have a great weekend. Glad I could give you some new tips Carlyn! I love chicken too. Thanks and enjoy! I could gobble up like 12 of these drumsticks! Pinned! Haha I probably would too if I didn’t forcefully stop myself. Thanks Justine! Thanks so much for the compliments and the feedback KC! 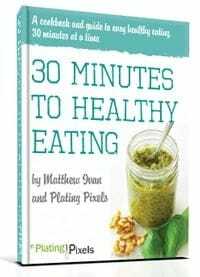 I try to learn something new on each recipe and share that with my readers. You are so welcome. I love your site and hope to pick up some food photography hints along the way. Your photos are beautiful. It does help and adds a nice compliment to the savory and umami chicken. Thanks Ananda! Yum ! These chicken drumsticks look mouth watering . This recipe looks easy to make.. Thanks for posting this recipe . It is super easy! Thanks Fareeha! Oh my goodness, yum! My kids would love these! Thank you for posting this recipe!! Thank you and you’re welcome Ashleigh! These are perfect for kids: messy. Wow…the pics are just mouth watering…I will be trying this out tomorrow with wings…what a breezy recipe…thanks for sharing.. Thanks Manal! These are super simple but oh so yummy. Hope you enjoy! These drumsticks look out of this world good! I like that they are done in the oven – the weather in England is hardly decent long enough to BBQ, but I so want to enjoy summer type foods. Thanks so much Sarah! Since I don’t have a grill I appreciate barbecue alternatives too. I just posted a slow cooker Carolina style pulled pork for same reason. Thanks and have an awesome summer! Thanks Molly! Glad it was useful. I used to do that too be honest. Those look as good if not better than those cooked on an outdoor grill. Happy Summer!! They definitely provide tough competition for grilled. You too Renee! You can’t beat a perfectly-cooked barbecue sauce drumstick for flavor! It’s one of my family’s favorite dishes! I agree Sabrina! Chicken is one of my favorites. And wings and drumsticks are so fun! Tooootally guilty of washing my chicken for the longest time! A great explanation of why that’s a big no-no. I’ve learned!! I was totally guilty of that too Hillary! I read about it in a couple places and stopped since. Plus you don’t have to clean sink after! Thanks Ananda! It was a rich colored sauce but I was surprised how vibrant it came out too! I just ate dinner, but this is still making me hungry! I’m sure there’s always room for seconds (ie more food). Thanks! These wings look amazing! Its actually almost TOO hot to be grilling anyways! The oven can bake them just as good. My tummy is rumbling for lunch now! These look delish. And your pictures are beautiful! So many amazing flavors!!!! This is a chicken recipe that I cannot wait to try!!! I wish I was sitting in the comfort of my AC controlled home. lol! Most of us don’t have AC in Washington state, but it’s been so hot the past few summers, it’s really time to consider having AC installed. Oh boy, that chicken looks really tasty. I’ve always said all baked chicken needs is a little salt and pepper, so you’re right on the money with that! I will have to give this a try this weekend. I’ve never placed the bbq on before baking. I’m guessing it makes the chicken even more delicious?! Thanks Tiffany! I didn’t know it got so hot in Washington. The salt and pepper is essential. I think I used it in every savory recipe of mine. Baking with sauce helps the flavor soak in, plus makes them extra moist. It also thickens up the sauce into a sticky glaze. Did you cover the chicken before putting in the over? 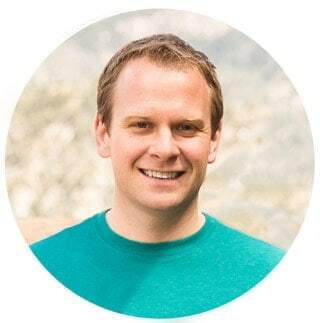 Hi Shavelle and thanks for the great question! No need to cover these in the oven. I’ll be updating this post soon with more tips!